Kyle told Bravo’s The Daily Dish, “If you think back to Season One Camille and Kyle, you would never imagine that one day she would be marrying somebody else and I would be her bridesmaid.” Kyle added that she was “honored and excited” to stand beside her friend on such a special day. RELATED: Camille Grammer Is Married! Camille and David C. Meyer were wed in a traditional Hawaiian ceremony. 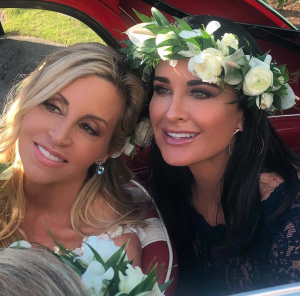 Luckily, it looks like the wedding was filmed for Season 9 of Real Housewives of Beverly Hills, so the fans can count on getting a behind-the-scenes look at the event. It looks like the wedding itself was drama-free, except for Kyle suffering a wardrobe issue with her bridesmaid dress. Thankfully, she was able to fix the dress herself in time for the ceremony. Naturally, some of the RHOBH cast attended the festivities, including Lisa Rinna, Teddi Mellencamp Arroyave, and Dorit Kemsley. Mauricio Umansky accompanied his wife, Kyle to Hawaii. So, who skipped the ceremony? Both Denise Richards and Erika Jayne were working, but Lisa Vanderpump also missed the nuptials. I guess we will find out why Lisa missed the wedding when the show airs. I am glad that Camille has found love again after her tumultuous divorce. TELL US: ARE YOU SHOCKED THAT CAMILLE ASKED KYLE TO BE A BRIDESMAID? WHY DO YOU THINK LISA MISSED THE WEDDING?